AbRam and SRK's camaraderie is dearly cherished and fans crave to get a glimpse of these moments. 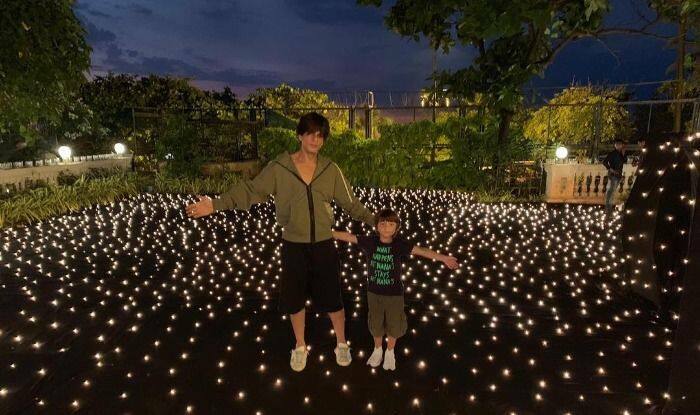 The festive spirit is contagious and not even AbRam Khan is shying away from it as he stands in the middle of a lit up ground and poses with daddy Shah Rukh Khan, with his arms open in SRK’s signature style. The picture uploaded on micro-blogging site Twitter, by Gauri Khan, drips with festive cheer coupled with love and warmth. In the picture, the Zero star is seen casually donning a military green zipped up hoodie, black shorts and a pair of white shoes while baby Khan dressed the other way round in a black tee, military green shorts and a pair of white shoes. Printed in bright green, on little munchkin’s black tee, are the words, “What happens at Nana’s stays at Nana’s.” The huge open space of SRK’s house, Mannat, in the backdrop of night sky, is lit up in an array of lights ahead of Christmas. In the middle of this enchanting fairyland looking-space stands the adorable father-son duo, recreating Shah Rukh’s iconic pose together at the center. AbRam and SRK’s camaraderie is dearly cherished and fans crave to get a glimpse of these moments. Gauri feeds to these cravings by regularly treating fans with her social media uploads, carrying pictures highlighting cute moments between the father-son duo. Today’s picture is no different and looks charming beyond belief. On the professional front, Shah Rukh’s recent release Zero, helmed by Aanand L. Rai opened to mixed audience reactions this Friday. The movie also stars Anushka Sharma and Katrina Kaif in pivotal roles.